The origin of these delights can be traced back to Catherine de Medici’s chefs, during the Renaissance. 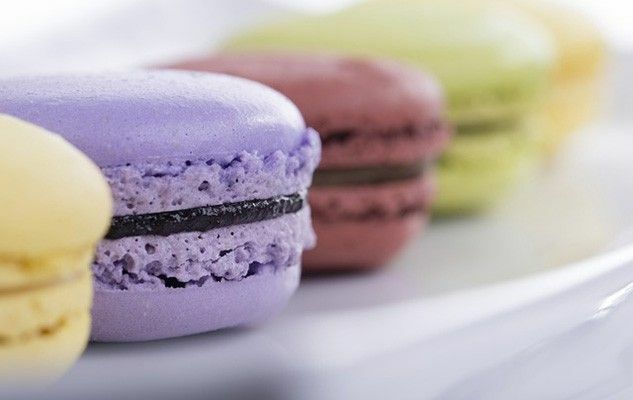 But it was the Parisian baker Ladurée, who created the modern macaron about 150 years ago, by sandwiching a ganache filling between two meringue shells. His store is still the recognized “temple” of macarons. Macarons are seemingly simple, but difficult to master. Many pastry shops now sell them, but few are really good. They are pricey, generally selling in the $2-3/ea. range. That’s a small price to pay for something entirely handcrafted and absolutely delicious, but it is far too much if you get a macaron that has been languishing on the counter. We have blind-tested macarons from 2 of the most prized “pâtisseries” in Montreal: Espace Europea and La maison du macaron . It was a very close call: Macarons from Espace Europea were esthetically perfect, and also yummy, but we still preferred La maison du macaron because of its exquisite creamy fillings. Another good place for macarons in Montreal should be Point G (have not tried yet). Please share with us your good addresses, reviews and even recipes! In the complitcead world we live in, it’s good to find simple solutions.